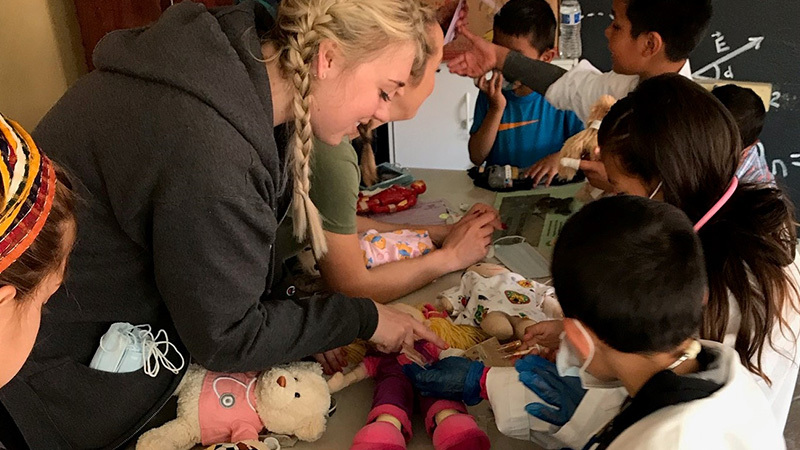 In February of this year, Director of Clinical Training for the Child Life Specialist Program, Alisha Saavedra, was part of a Students for International Mission Service (SIMS) trip to Baja, Mexico. One of the locations that the SIMS group visited was Door of Faith Orphanage (DOFO) in La Misión. DOFO is an amazing organization that has been providing orphan care for over 50 years. They have grown to be one of the largest orphanages in Baja, caring for approximately one hundred children at any given time. It was there that the plan was put into motion to later return on March 15th-17th with students and faculty from the Child Life Specialist program to provide medical play for the children. A handful of participants from other LLUH disciplines also accompanied the team. "I am very passionate about making the children feel safe and understanding what is going on around them as much as possible. They have had so much trauma in their life and if you can provide them with a little bit of knowledge so they can feel more relaxed and in control when they see a doctor, I think that would be wonderful!" As child life specialists, our goal is to help children cope with the trauma and stresses of health crises as well as support their families. Although child life specialists are typically hospital-based, we also do a great deal of community and international outreach through grief camps, facilitate support groups, educate children at schools through teddy bear clinics, and much more. Based on the feedback and input provided by DOFO, one of the stressors that the children often have is going to a doctor’s office visit or having their ears irrigated. A teddy bear clinic and syringe painting activity seemed to be a great intervention for the child life team to provide in order to address some of their fears and anxieties. The teddy bear clinic was advertised prior to the team's arrival so that the children could anticipate and prepare to bring their own teddy bear, stuffed animal, or action figure for a pretend visit to the doctor. Each "friend" checked in at a registration station and received a hospital ID bracelet. They went on to have a routine medical exam, which included immunizations with needleless syringes. The children also had the opportunity to learn about fixing broken bones and were able to get a pretend cast on their finger. The area where many children stayed occupied was the medical play table where they could engage in free play and explore real medical equipment such as medical tape, Band-Aids, anesthesia masks, stethoscopes, blood pressure cuffs, IV bags, etc. Some even tried on a lab coat and commented that they may become a doctor one day. As some students were bilingual, and there were a few other trip members who could assist with interpreting, the child life students worked together to adapt and combine their skills to meet the needs of the children. Overall, approximately 60+ children attended the teddy bear clinic. Dorm parents, staff, and even one of DOFO's golden retrievers joined in. Evidence-based practice tells us that although it appears as if children are "just playing”, much more is actually happening. By providing this type of healthcare play experience, the children at DOFO were able to interact with medical equipment in a non-threatening way, to have the opportunity to be in control and gain mastery, and to learn about what to expect during their health encounters. The child life students also had the opportunity to teach the children useful coping techniques for when they go to the doctor, in addition to clarifying any of the children's misconceptions. It was exciting for them to see the children engage with the medical equipment or come back repeatedly to a particular station. Often a child would know exactly what to do or what the equipment was used for. With knowledge of previous child life team trips to China, where medical and therapeutic play was provided, the students were eager to witness the power of play and its significance as a universal language. "I learned a great deal about Child Life Services and the special healing you bring to those who need it most. It was truly amazing to observe how easily you engaged with children you never met and will most likely never meet again. I hope none of them ever need the type of healing you bring but I saw their eyes twinkle and dreams beginning to form as they watched and learned in amazement of what is possible in the world and what they could aspire to be some day." In addition to the teddy bear clinic, the child life team provided a syringe painting activity. The children were very enthusiastic to squirt paint and get messy! It was amazing to see the masterpieces that they created and the pure joy they had while expressing themselves through art. The team even enjoyed some free time with the children on the playground, assisted during meal times, and toured a nearby wellness clinic. Part of what made this inaugural trip such a success was the group's wonderful teamwork and the compassion we showed to the children and staff of DOFO. As the team reflected on this experience, we were reminded to do all things with joy. A smile is still a smile, no matter what language one speaks. Our time at DOFO was well spent and the Child Life Specialist program is so honored to be asked to come back again in the future to continue providing health care play and a grief class. DOFO captured many of our hearts and we look forward to a continued partnership in the years to come. ► See more photos from the trip here!